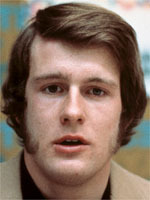 East Germany's Ulrich Wehling entered the Winter Olympics hall of fame after becoming the fifth athlete in history to win a gold medal in three consecutive games. This massive achievement also played a major role in increasing the popularity of the Nordic combined event, helping turn it into the core Winter Olympic event it is today where German teams are frequently strong. Wehling first caught the eye at the Spartakiades communist youth games held in East Germany in 1968, where his solid build and obvious strength set him apart from other competitors. He caused a sensation at the 1972 Winter Games at Sapporo, when aged only 19, and with only a world junior title under his belt, he came from nowhere to snap up the gold medal. World champion in 1974 at Falun, in Sweden, he chalked up his second Olympic win by taking the gold medal at the 1976 Games in Innsbruck, his huge lead in the ski-jump giving him more than enough leeway in his battle with West German cross-country specialist Urban Hettich. Wehling could only manage third place at the 1978 world championships, but bounced back at Lake Placid in 1980 to complete his historic treble, winning the gold medal ahead of Finland's Juokko Karjaleinen. That victory enabled him to go one better than Norwegian star Johan Grottumsbraaten, who won the Nordic combined event at the 1928 and 1932 Winter Olympics. Wehling became the first athlete outside figure skating to realise this fabulous treble. Wehling's love of the sport saw him move into the administrative side of the event. He was race director for the Nordic combined event at the 2006 Turin Games and also at the 2007 Nordic World Ski Championships at Sapporo, 25 years after storming to his first Olympic title at the same venue.